After the conversation about his resigning teachership with Hirata, Horikawa moves to his hometown with his son. This six minutes concerns the beginning of their life-long sojourn. It is often noted that an image of train is the central device of Ozu’s films. Here, this device, shot from on board, frames the conversation between the father and the son. Their exchanges signify their rootlessness, home lost. The father says they are going back to his hometown, but there is no place which they can call their own. The shots of this conversation are conventional cutbacks with the exception of its lower camera positions, which brings the larger area of bright exterior background. In fact, it barely avoids the direct sunlight or lens flares. The left cheek of the boy’s face is washed out, losing the details due to the strong reflection, while the right half of the body sinks in the dim interior. I believe this is one of the rarest cases in which Ozu utilizes the source of natural light to this degree. His direction, especially those in later years, is noted by “well-lit” scenes, so that his balanced compositions are well represented on screen without losing their little details. But here, the gradient of the brightness within the frame is so great, with little regard for “balance”. Those living are in the dark, while the universe filled with brightness is beyond their space. Horikawa talks about “your grandfather’s graves and your mother’s grave”. Another reference to graves. From the beginning, this film resides in the world of eerie human habitat. Almost none but other than Horikawas exists in the train, in the streets, and in the canteen. As if, in this world, while other human souls are all lost, the father and the son have to find their own peaceful place but doomed to wander about. The ruin of the old castle, only the dry stone foundations of which survived, is the stage for the first critical conversation between the father and the son. This seems to be the remains of the Komoro castle, in the city of Komoro, almost 10 miles east of the city of Ueda, Nagano. 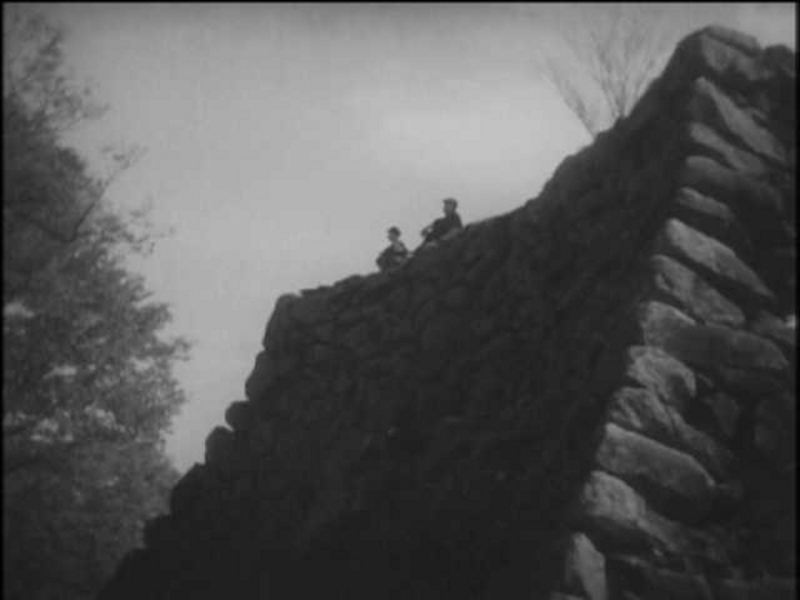 As you can see from the photo of the remains, this dry stone motte is not as large as it appears to be in the film. Moreover, you do not view the scenery from the top of this construction as this is one of the very rare examples of the Japanese castles built on the basin, lower in altitude compared to the city around it. But the film gives an illusion that the father and the son are looking down the city. Again, the domineering dark dry stones in front overshadow the sky beyond.